If you’re trying to adopt good e-mail habits and clear our your inbox, creating a system to deal with all of your incoming e-mail is an essential first step. But one of the reasons e-mail often gets stuck in an Inbox is that a reply is needed, but the time and energy required to craft that reply is too daunting. Here are a three tricks to help you speed up the process-at least part of the time. The longer your replies, the more likely you are to get still more-elaborate responses from your correspondents, leading to an endless cycle of e-mail. Try forcing yourself to keep every e-mail reply to just a few sentences. At first, the effort required to make concise replies may actually take you more time, but once you get the knack of it, you’ll find that it goes much faster. Several third-party utilities for OS X can watch what you type and automatically turn short abbreviations into useful strings such as your address, the current date, or phrases like “To whom it may concern.” My favorite utility in this category is Riccardo Ettore’s TypeIt4Me. Other popular options are SmileOnMyMac’s TextExpander and Ergonis Software’s Typinator. Although many people use these tools to correct frequently misspelled words (“teh” for “the”) and insert brief text snippets, they’re equally good for inserting longer boilerplate text into e-mail replies. If you find yourself answering the same questions or sending out the same information repeatedly-directions to your office, instructions for operating the coffee machine, an explanation for why you haven’t replied to someone’s message in a month-you can put all this text into one of these utilities. And then, when sending a message, you simply type your shortcut (like imaloser) and the utility will replace it with the text you designated (for example: “I’m so sorry for not replying to your e-mail message sooner, but I’ve been extremely busy; I have so many messages in my Inbox that it takes me hours to ignore them all every day!”). Another way to quickly insert boilerplate text is by using your e-mail program’s built-in signature feature. Ordinarily, your signature (which may include your name, title, telephone number, favorite quote, or whatever) appears at the bottom of a message much like a signature in a written letter. 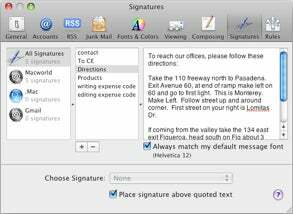 But by configuring several different signatures and choosing the right one for each message, you can include as much text as you want (just as with a text-expansion utility) with a single click. Use the Signatures preference in Mail to add often-used text to your e-mails. To set up signatures in Mail, go to Mail: Preferences, click on the Signatures icon, and click on the plus-sign button. Enter a name for your signature, and type all the text you want it to include in the field on the right. Then drag the finished signature onto the name of each account where you want it to be available. When composing a message, you can choose from among your signatures using the pop-up Signature menu in the header portion of the window. In Entourage, the process is similar. Choose Tools: Signatures and click on the plus-sign button. Enter a name for the signature, type in the desired text, and close the window. When composing a message, choose a signature using the pop-up Signature button on the toolbar. Although judicious use of signatures can save you time and typing, keep in mind that most people don’t want to read your life’s story or click through a dozen of your favorite URLs. Try to keep your everyday signature as brief as possible.